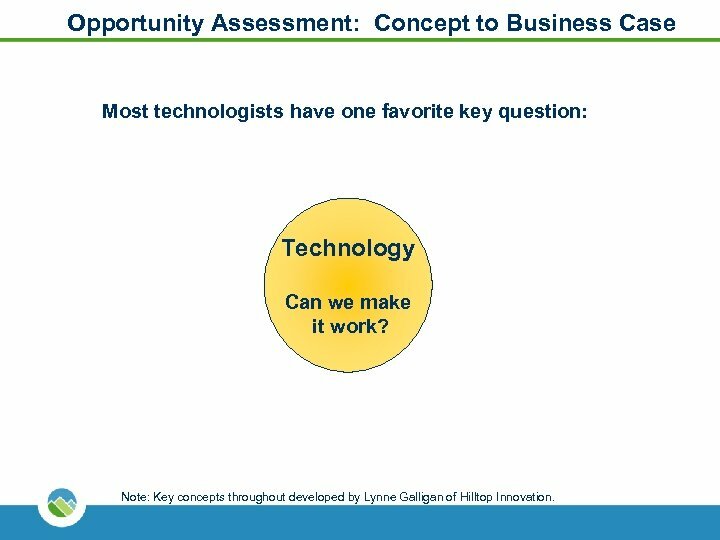 Opportunity Assessment: Concept to Business Case Most technologists have one favorite key question: Technology Can we make it work? 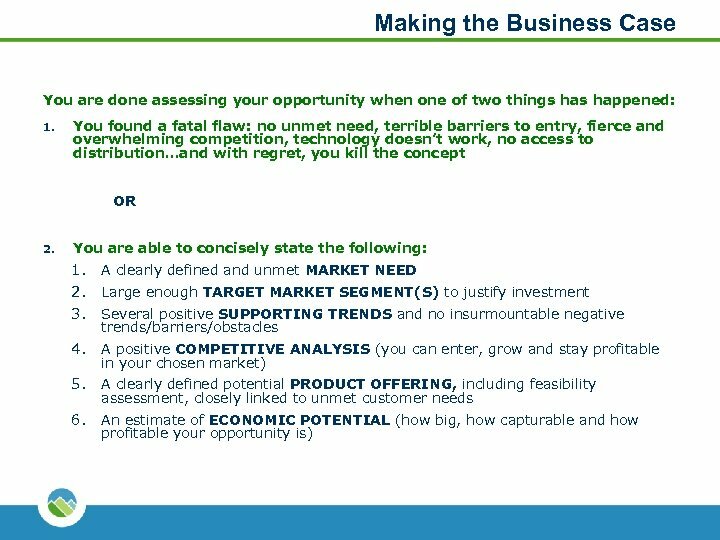 Note: Key concepts throughout developed by Lynne Galligan of Hilltop Innovation. 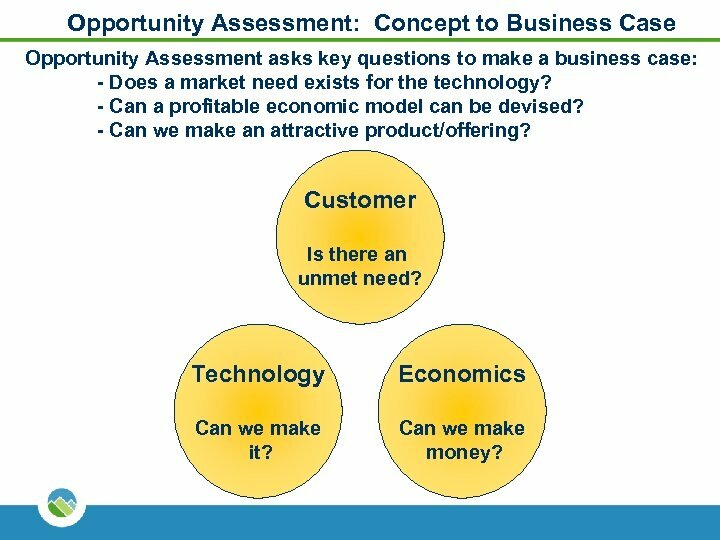 Opportunity Assessment: Concept to Business Case Opportunity Assessment asks key questions to make a business case: - Does a market need exists for the technology? - Can a profitable economic model can be devised? - Can we make an attractive product/offering? Customer Is there an unmet need? Technology Economics Can we make it? Can we make money? 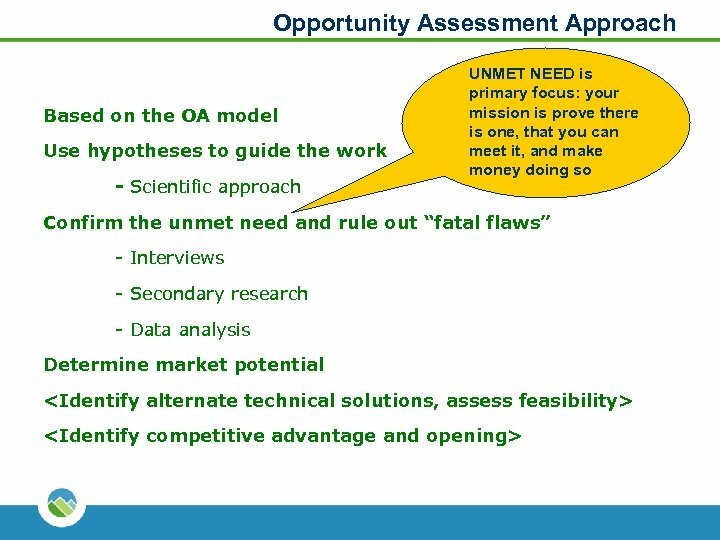 Opportunity Assessment “Need, Succeed and Greed” “Need”: What is the unmet need? “Succeed”: What are you offering to meet that need? Can you pull it off? 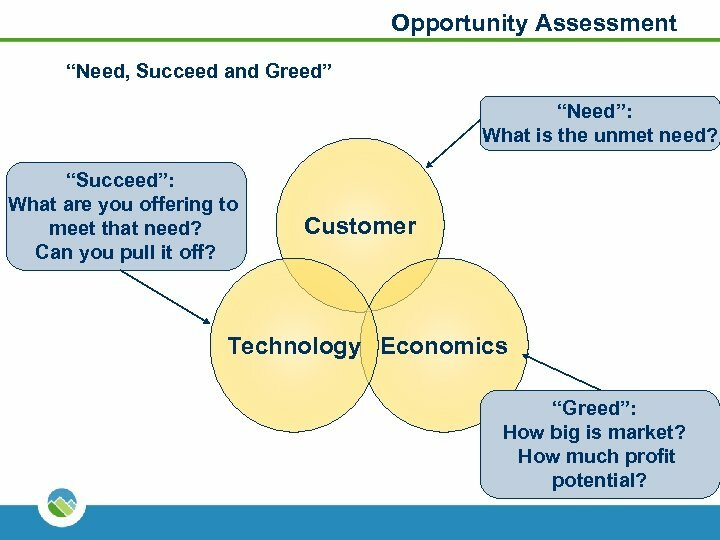 Customer Technology Economics “Greed”: How big is market? How much profit potential? 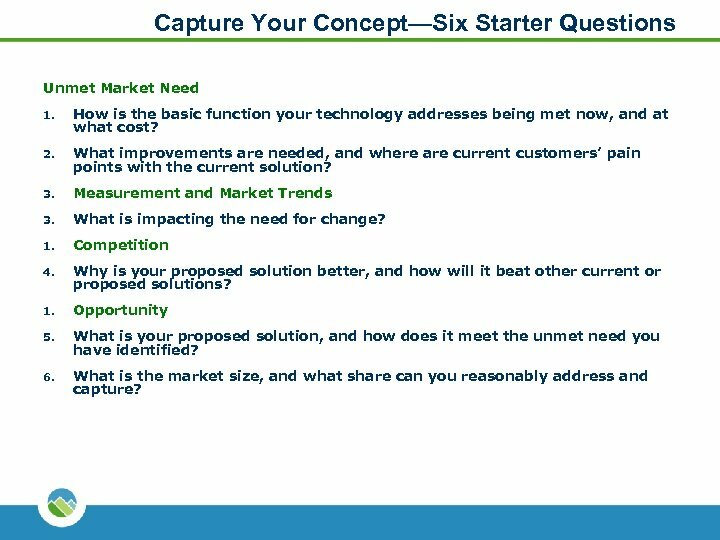 Capture Your Concept—Six Starter Questions Unmet Market Need 1. How is the basic function your technology addresses being met now, and at what cost? 2. What improvements are needed, and where are current customers’ pain points with the current solution? 3. Measurement and Market Trends 3. What is impacting the need for change? 1. Competition 4. Why is your proposed solution better, and how will it beat other current or proposed solutions? 1. Opportunity 5. What is your proposed solution, and how does it meet the unmet need you have identified? 6. What is the market size, and what share can you reasonably address and capture? 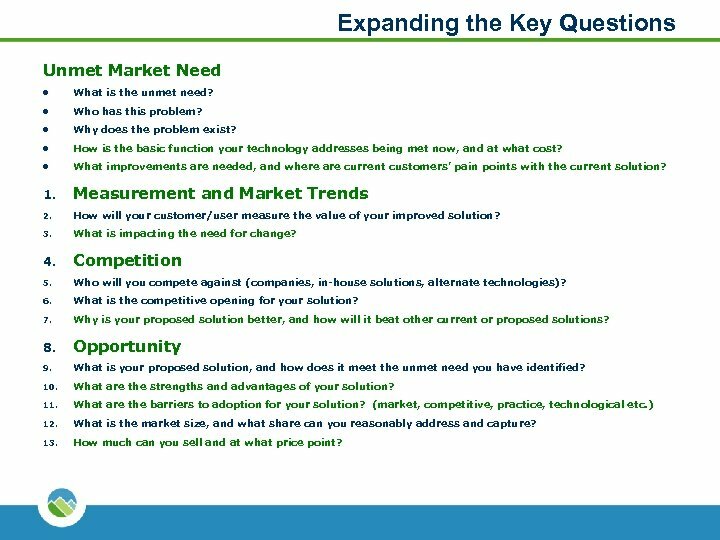 Expanding the Key Questions Unmet Market Need l What is the unmet need? l Who has this problem? l Why does the problem exist? l How is the basic function your technology addresses being met now, and at what cost? l What improvements are needed, and where are current customers’ pain points with the current solution? 1. Measurement and Market Trends 2. How will your customer/user measure the value of your improved solution? 3. What is impacting the need for change? 4. Competition 5. Who will you compete against (companies, in-house solutions, alternate technologies)? 6. What is the competitive opening for your solution? 7. Why is your proposed solution better, and how will it beat other current or proposed solutions? 8. Opportunity 9. 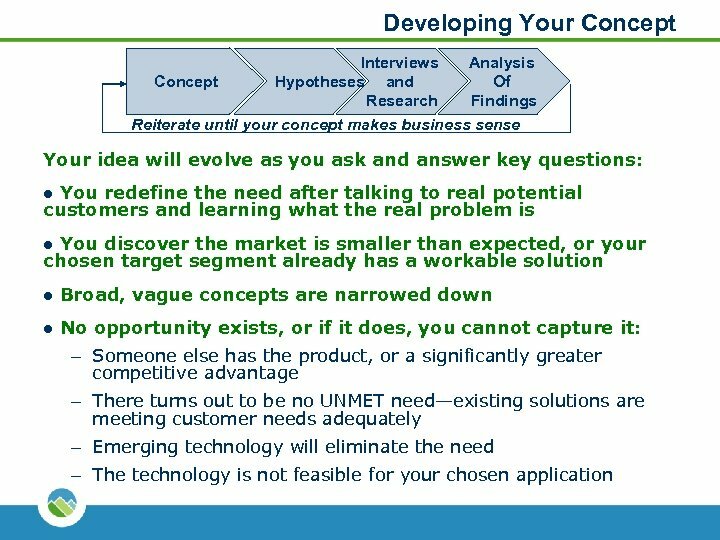 What is your proposed solution, and how does it meet the unmet need you have identified? 10. What are the strengths and advantages of your solution? 11. What are the barriers to adoption for your solution? 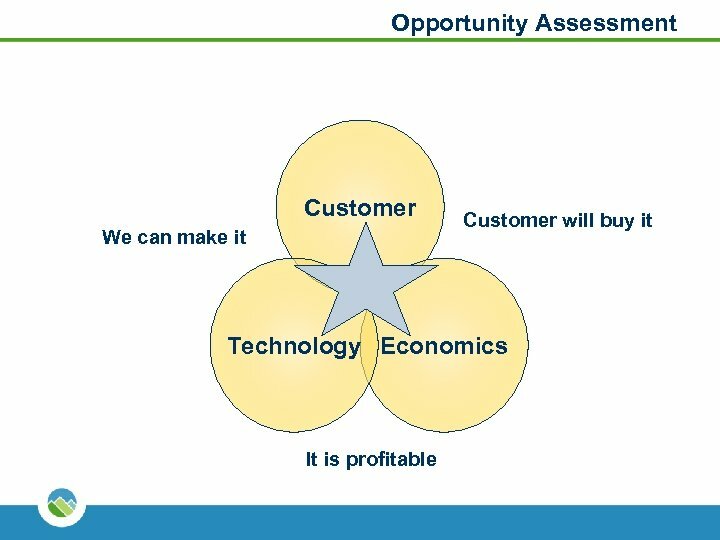 (market, competitive, practice, technological etc. ) 12. 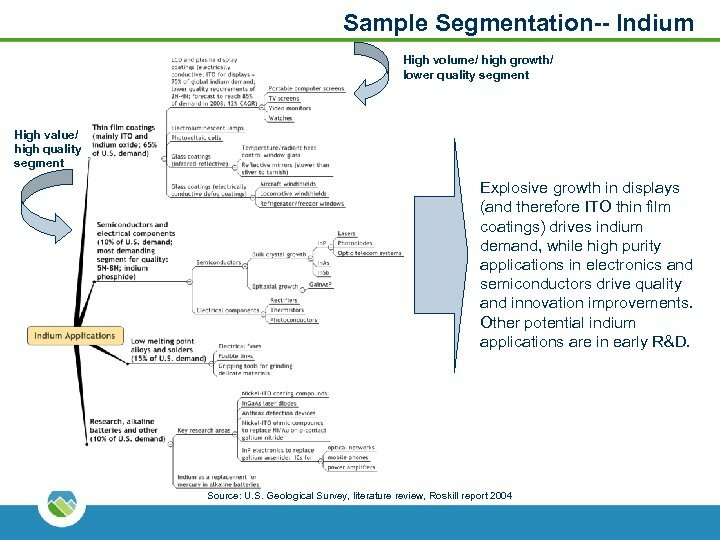 What is the market size, and what share can you reasonably address and capture? 13. How much can you sell and at what price point? 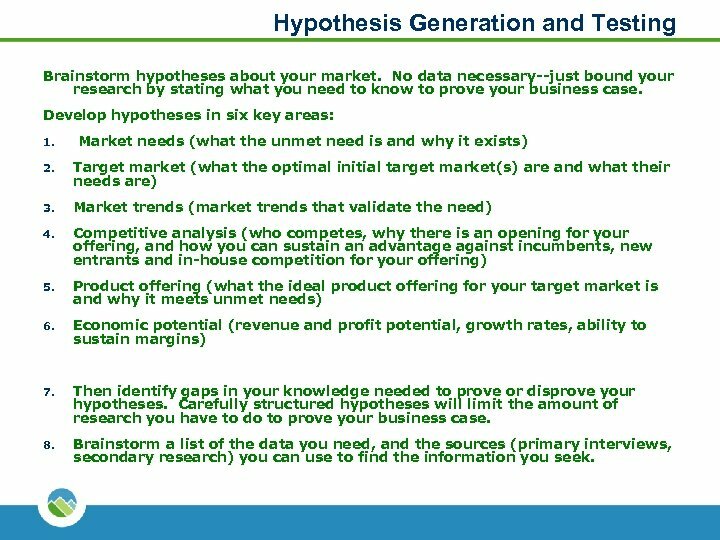 Hypothesis Generation and Testing Brainstorm hypotheses about your market. No data necessary--just bound your research by stating what you need to know to prove your business case. Develop hypotheses in six key areas: 1. Market needs (what the unmet need is and why it exists) 2. 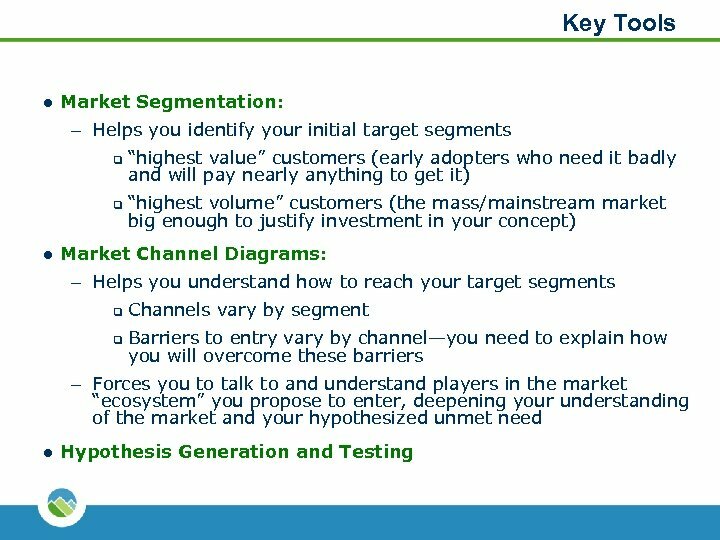 Target market (what the optimal initial target market(s) are and what their needs are) 3. Market trends (market trends that validate the need) 4. 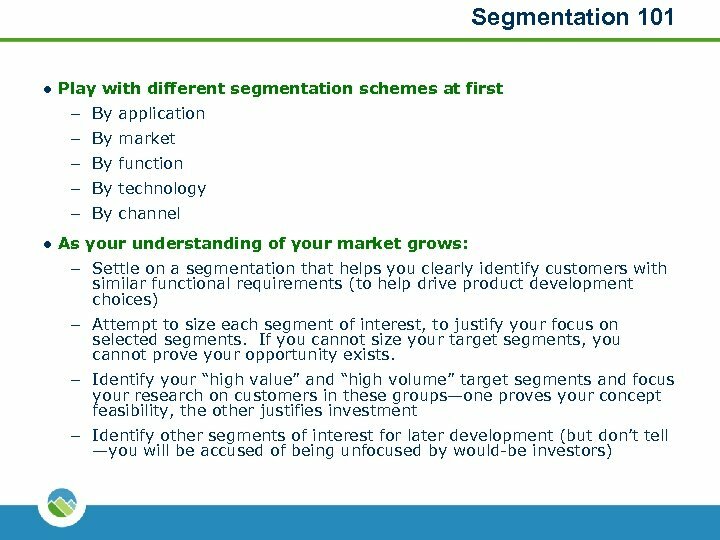 Competitive analysis (who competes, why there is an opening for your offering, and how you can sustain an advantage against incumbents, new entrants and in-house competition for your offering) 5. Product offering (what the ideal product offering for your target market is and why it meets unmet needs) 6. Economic potential (revenue and profit potential, growth rates, ability to sustain margins) 7. Then identify gaps in your knowledge needed to prove or disprove your hypotheses. Carefully structured hypotheses will limit the amount of research you have to do to prove your business case. 8. Brainstorm a list of the data you need, and the sources (primary interviews, secondary research) you can use to find the information you seek. 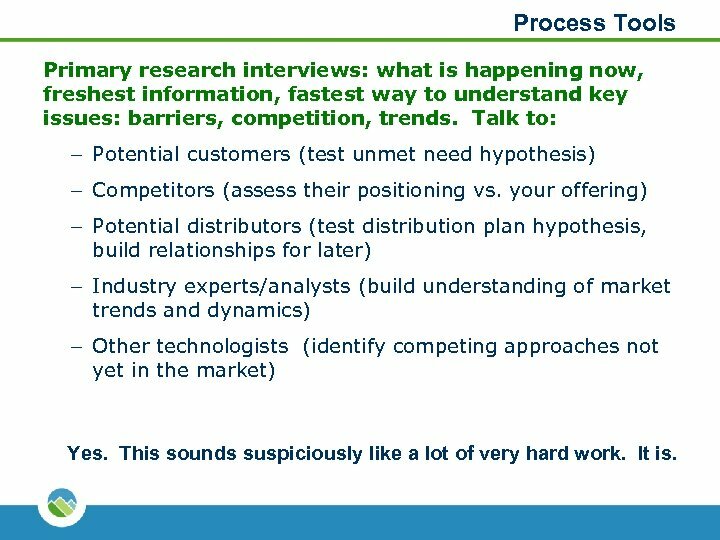 Process Tools Primary research interviews: what is happening now, freshest information, fastest way to understand key issues: barriers, competition, trends. Talk to: – Potential customers (test unmet need hypothesis) – Competitors (assess their positioning vs. your offering) – Potential distributors (test distribution plan hypothesis, build relationships for later) – Industry experts/analysts (build understanding of market trends and dynamics) – Other technologists (identify competing approaches not yet in the market) Yes. This sounds suspiciously like a lot of very hard work. It is. 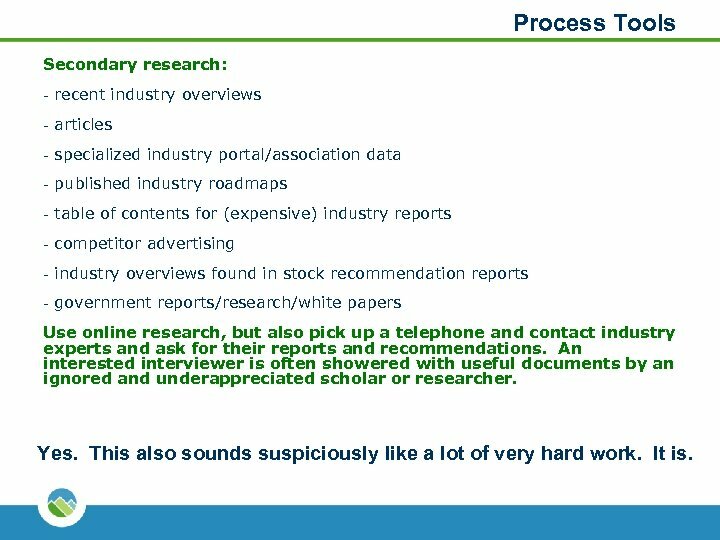 Process Tools Secondary research: - recent industry overviews - articles - specialized industry portal/association data - published industry roadmaps - table of contents for (expensive) industry reports - competitor advertising - industry overviews found in stock recommendation reports - government reports/research/white papers Use online research, but also pick up a telephone and contact industry experts and ask for their reports and recommendations. An interested interviewer is often showered with useful documents by an ignored and underappreciated scholar or researcher. Yes. This also sounds suspiciously like a lot of very hard work. It is. 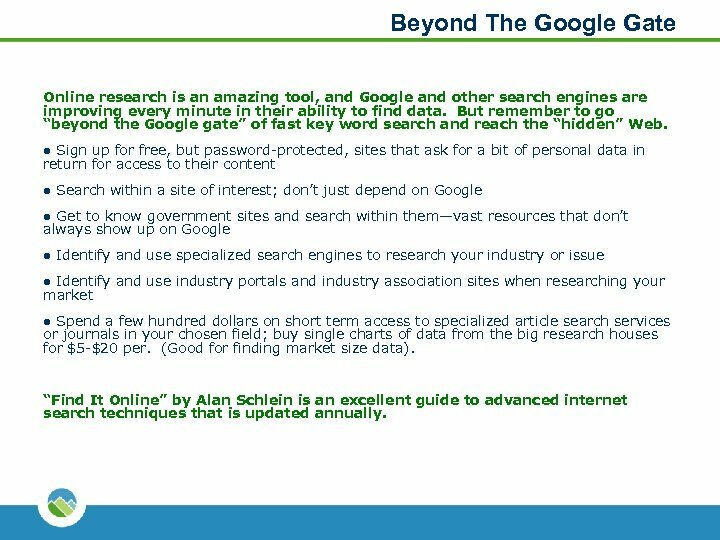 Beyond The Google Gate Online research is an amazing tool, and Google and other search engines are improving every minute in their ability to find data. But remember to go “beyond the Google gate” of fast key word search and reach the “hidden” Web. Sign up for free, but password-protected, sites that ask for a bit of personal data in return for access to their content l l Search within a site of interest; don’t just depend on Google Get to know government sites and search within them—vast resources that don’t always show up on Google l l Identify and use specialized search engines to research your industry or issue Identify and use industry portals and industry association sites when researching your market l Spend a few hundred dollars on short term access to specialized article search services or journals in your chosen field; buy single charts of data from the big research houses for $5 -$20 per. (Good for finding market size data). l “Find It Online” by Alan Schlein is an excellent guide to advanced internet search techniques that is updated annually. 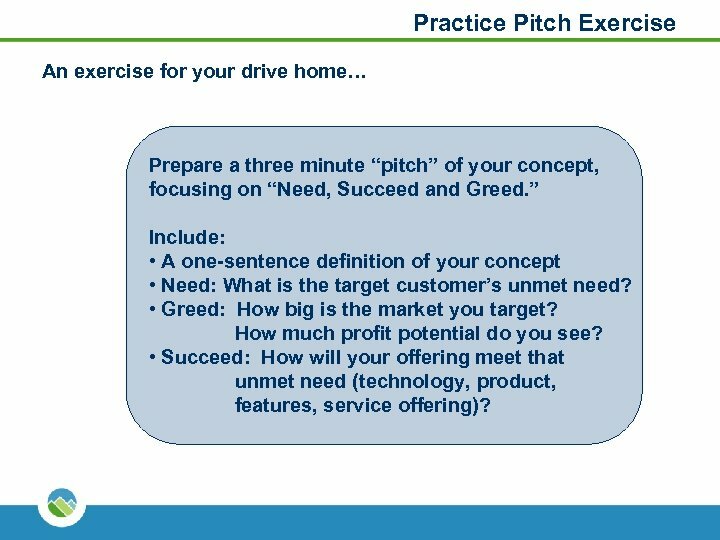 Practice Pitch Exercise An exercise for your drive home… Prepare a three minute “pitch” of your concept, focusing on “Need, Succeed and Greed. 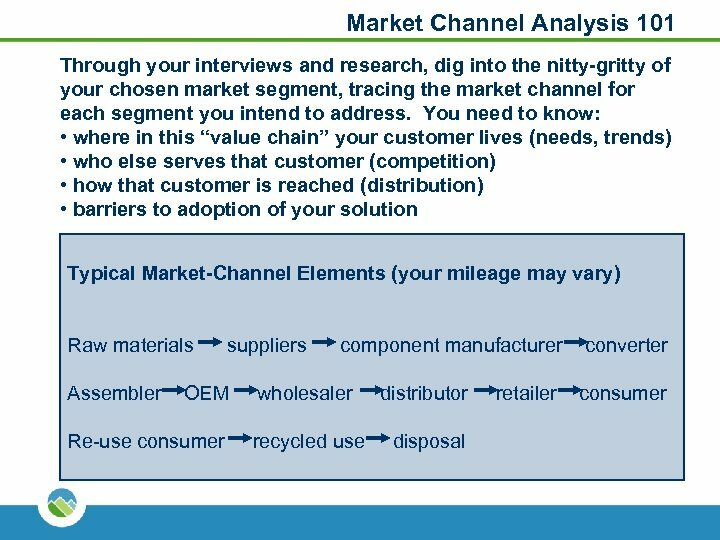 ” Include: • A one-sentence definition of your concept • Need: What is the target customer’s unmet need? • Greed: How big is the market you target? How much profit potential do you see? • Succeed: How will your offering meet that unmet need (technology, product, features, service offering)?